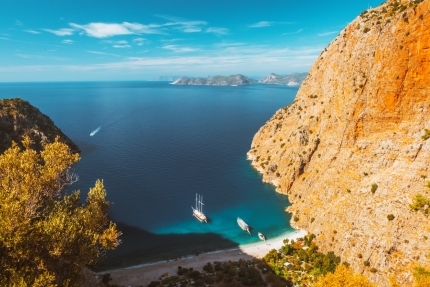 Spend a week discovering the southern coast of Turkey, from Marmaris. Our charming and stylish three-masted motor yacht is built to the highest of standards. We will get to know the Turkish coast and back-country between Marmaris and Ekincik from the intimate perspective of a bicycle. Our tour guide will point out the unique natural wonders and historical cities in the region, enjoying all the highlights. Admire the famous graves of Kaunos, which were cut into the cliffs circa 4 BC by the Lycian coastal inhabitants. We’ll be mesmerized by the breathtaking Saklikent Canyon, enjoy the pulsating night life of the port cities in the cafes and bars, and spend our evenings in the deserted bays, being gently rocked to sleep by the ocean. Come enjoy this Floating Adventure with Active Journeys!